Note: These events are subject to change. Just in time for the holidays Hotel Galvez is hosting a book signing featuring Gary Cartwright, author of Hotel Galvez: Queen of the Gulf from 11 a.m. to 2 p.m. in conjunction with the hotel’s Sunday Brunch. The hotel will begin to take advance orders for the book in November. Hotel Galvez invites guests to see its new Hall of History on the lower level of the hotel. The hotel will unveil this new display at 10 a.m. The display will include framed panels about the history of the hotel as well as various items exhibited in two display cases purchased from the original Eiband’s Department Store. The hotel is collaborating with the Galveston County Historical Museum on this exhibit. As part of the centennial celebration, Hotel Galvez is inviting regional artists to submit their rendition of this landmark hotel as part of an artist competition. Entries will be displayed in conjunction with the Hall of History unveiling. The hotel owners will provide a cash award to the winning artist and the hotel will reproduce the winning art piece as a commemorative poster. Hotel Galvez invites its former brides and grooms who celebrated their nuptials at the hotel to come back for a mass wedding vow renewal on the front lawn at 1 p.m. Couples will celebrate with a champagne toast and cake. The hotel will provide complimentary accommodations to the couple with the earliest wedding date and coming from the farthest distance. Couples should notify the hotel of their participation in advance. The hotel will offer a special weekend package as part of the weekend. Brides who would like to display vintage wedding dresses (1920s-1970s) are encouraged to contact Sarah Harano at mktgasst@mitchellfamilycorp.com or (409) 762-0062. Hotel Galvez invites guests to enjoy its Cinema and Café Under the Stars at the hotel. The hotel’s special outdoor movie theater will offer festival and reserved seating. Reserved seating will include dinner. Movie will begin showing at sundown. Popcorn and other movie refreshments will be available. In honor of Bernardo de Galvéz, Bernardo’s Restaurant at Hotel Galvez invites culinary enthusiasts to learn the art of Spanish cooking during this special demonstration by a Spanish celebrity chef. The dinner, which begins at 7 p.m., will be paired with Spanish wines. Advance reservations are required and only a limited amount of seating is available to this event. This wine pairing dinner is scheduled as part of the 2011 Galveston Island Food and Wine Festival. Hotel Galvez is the title sponsor for the Bathing Beauty Revue coordinated by IBC. Between 1920 and 1932 Hotel Galvez served as headquarters for the International Pageants of Pulchritude, the beauty pageants that were predecessors to the Miss Universe Pageant. IBC revived the event in 2009 and is hosting the pageant in front of Hotel Galvez where it was originally held. Contestants compete in period and contemporary bathing suits. Hotel Galvez will host a picnic saluting the revue on the lawn from 11 a.m. to 1 p.m.
Hotel Galvez invites guests and the community to join the hotel for a weekend of events commemorating its 100th anniversary. 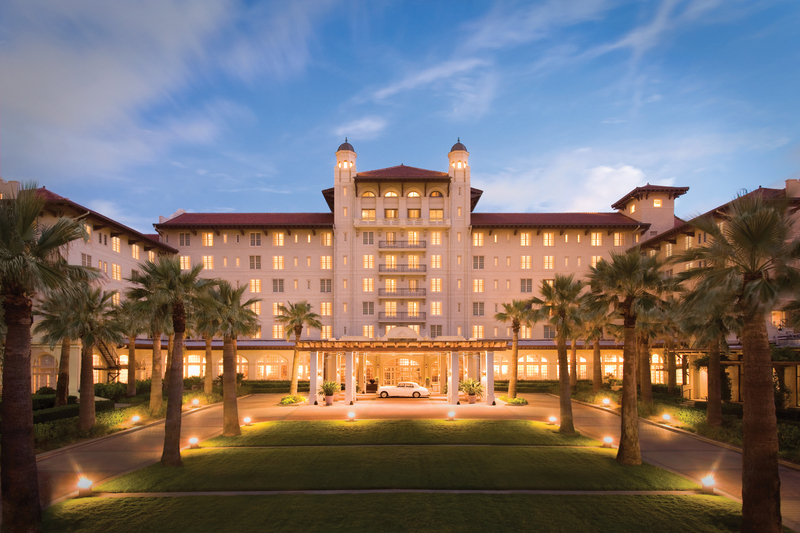 On Friday, the hotel will host a welcome event with live music in the lobby and on Saturday, Hotel Galvez will come alive with activities and live music during the day throughout the hotel grounds and culminating with a fireworks show over the Gulf of Mexico. The hotel will offer a special package as part of the weekend. Galveston Island has been a tourism destination for visitors for more than 100 years. In the late 1800s, visitors would come to Galveston to enjoy the “healing powers” of the Gulf of Mexico. Galveston’s beaches are still the biggest attraction on the island. Learn more about Galveston’s history of tourism through this exhibit. This is a project of Rosenberg’s Library’s Galveston and Texas History Center. The exhibit will be on display in the hotel’s lobby and Hall of History. Rocky and Sherrie Forshey donated more than 700 postcards of Galveston, circa 1900-1930, to Rosenberg Library’s Galveston and Texas History Center in February 2009. This collection, as well as Rosenberg Library’s collection of postcards, will provide a history of Hotel Galvez through the ages as illustrated in postcards. The slideshow presentation will be shown in the Hotel Galvez Hall of History. In the year 1911, Hotel Galvez and Gaido’s Restaurant opened in Galveston. Learn more about happenings in Galveston in this pivotal year through a presentation by the Rosenberg Library’s Galveston and Texas History Center. The slideshow presentation will be shown in the Hotel Galvez Hall of History. Each Thursday in October, Hotel Galvez offers a ghost tour and dinner buffet in Bernardo’s Restaurant. Guests are invited to enjoy a one-hour ghost tour of the hotel, led by Hotel Concierge Jackie Hasan, followed by dinner at Bernardo’s. During the tour, Hasan will use an electromagnetic field detector and infrared thermometer to conduct a paranormal investigation of Hotel Galvez. Advance reservations are required. The cost is $35 per person. Make reservations by calling Bernardo’s Restaurant at 409-765-7721. Hotel Galvez invites guests and the community to celebrate the start of the holidays with its annual holiday lighting celebration with Santa Claus, live holiday entertainment and the official lighting of the hotel’s 35-foot Christmas Tree on the front lawn. The hotel will offer a special weekend package as part of the weekend. Hotel Galvez will celebrate the holidays with Sunday Brunch with Santa. Guests at Sunday Brunch will have the opportunity to visit with Santa Claus, take photos and will receive a holiday treat. Reservations are recommended. Make reservations by calling Bernardo’s Restaurant at 409-765-7721.